Make a Bear parties are the latest addition to our ever growing range of entertainment services. We have found some fantastic suppliers who love Bears, Jungle and Farm animals, Unicorns and Dinosaurs, as much as we do. Our Make a Bear Parties are available to hire in Burton on Trent, Swadlincote, Derby, Uttoxeter, Ashbourne and all surrounding areas. For larger bookings we can travel outside of these areas. Please contact us for a quote. 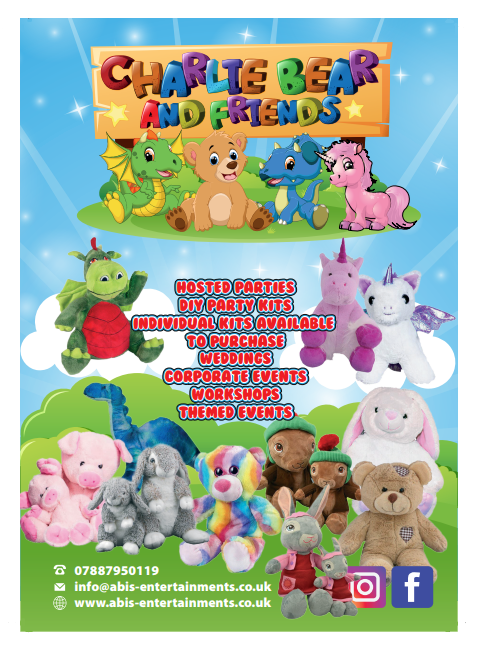 Each child will receive a pack with the animal skin, fibre fill, heart and accessories to bring their new friend to life, making them an ideal activity for a party or just a treat! We can supply the packs so that you can lead your own Make a Bear Party or we can supply a Party Host to do this for you. There are lots of options available. We can even provide individual kits for you to give as a gift. If you choose for one of our packages with a Party Host, they will lead the bear making activity, crafts and games. We can also provide a pass the parcel ( for an additional cost) which will include sweets/ small prize in each layer and a bear-making related prize as the main prize. Alternatively if you prefer you could provide your own pass the parcel for us to use. You may have your own ideas and suggestions which we are happy to try and accommodate. Please get in touch so we can talk through any suggestions you may have.